Richard Charles Kirk grew up in the Eastend of London before joning the London Royal Fusiliers, a Territorial Regiment, in 1938. By 1939 War threatened and Richard was called to arms and was stationed at St.Catherines Dock, working as a pay clerk before guarding the Tower of London. Soon enough the Luftwaffe came and hence the "Blitz" was on. Richard joined the many who became Air Raid Wardens and assisted the evacuation of civilians from the bombings and helped fight the fierce fires round the docks and central London. 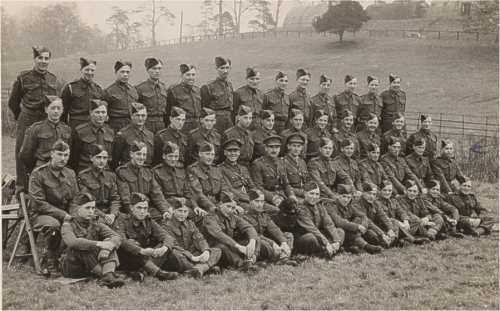 But as the war progressed the Army took to training the people of Britain for the eventual Allied invasion of Europe. Richard began his fulltime training at Stanmore when on exercise he sustained a head injury in a Lorry Accident which landed him in Hospital. Im sure, knowing him, that the injury was minor compared to the grief he would have given the Nursing staff, and he was subsequently treated at Woodford Green, Enfield chase and St. Bartholomews before returning to duty. Upon his return he was transferred from the Fusiliers into the Royal Artillery. His training took place in Norfolk and on the Salisbury Plains. Richard was good at Maths and soon earned recognition gaining him responsibilities issuing petrol and learning to range find on the big artillery pieces. You have to bear in mind that the War rationed everything, so a simple sounding task like the issue of fuel was actually a very precise task. The training began to take direction. The impending invasion, although secret, was structured with each man knowing his role in the offensive. Richard spent time learning to drive tanks and practiced beach assaults with armoured vehicles being driven on and off Amphibious Landing craft. On 6th June 1944, the Allied Forces returned to the coast of France and so started D-Day. The British forces had been repelled from the same coastline 4 years earlier and it was going to be a hard slog through a few countries inorder to defeat the enemy. Richard landed at Sword Beach on D-Day plus 2 and the push began. At that time, Elements of the Royal Artillery were amalgamated into the Guards Armoured Division, and it was this mass of armour that supported the Infantry in its struggle through the fields and towns as the Allies began to build a frontline so that supplies and landing points could be secured. Towns and villages were recaptured, and it was at Caens that Richard first saw and tasted the brutality of war. By design, Richard's Artillery and Armoured brigades were present and supportive in the famous battles and operations throughout the drive to the Rhine. The Guards Armoured Division participated at Arnhem in Operation Market Garden and Also The Battle of the Bulge towards the end of 1944. 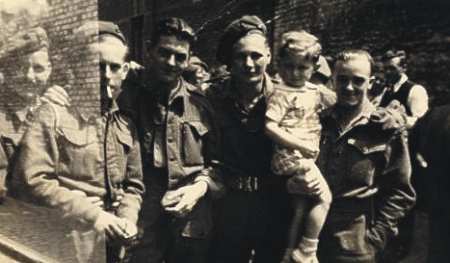 The war took Richard and his comrades through France, Holland and Belgium before reaching the Rhine. He was one of the lucky ones who survived the war, but not without injury as he was struck by shrapnel when the leading tank was destroyed by a landmine on a bridge over the Rhine. Unfortunatley, a friend of his who he knew from home was killed in the same incident and probably the worst part of it was that the War ended just a few days later. The Allies remained in Germany after the war, as did Richard. He returned home and was demobbed from the Army in april 1946. He stayed on National Reserve until 1965. "He has served with the Battery since January 1942 and was employed in a capacity requiring accuracy, speed and a knowledge of mathematics at which he proved himself the most efficent. A capable man who has given invaluable assistance in the Quartermasters Stores in a position of trust for the past nine months and during a very difficult period. He has a most pleasant manner, is well dressed and thoroughly honest, sober and trustworthy. A popular member of the Battery who has given every satisfaction".